Still think all those popular home remedies that talk about the use of onion to treat alopecia and regrow hair are hypes? We thought so too till we decided to find out what science has to say concerning this. Many people suffer from hair loss and there exist so many treatments for hair loss, such as Foligen supplements. One study decided to test the effectiveness of raw onion juice in the treatment of alopecia. The study divided participants into two groups, consisting of both males and females. The first group of people were going to apply onion juice on their hair while the second group (control group) were going to use just water. furthermore, at 6 weeks hair regrowth was seen in 86% of the patients with males having the highest rate of hair growth while for those who used tap water, only 13% of them saw scanty hair growth. 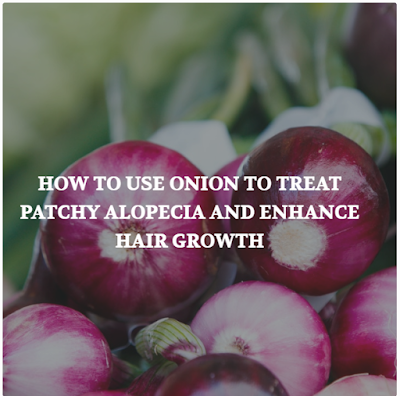 This study concluded that applying onion juice on the hair twice a day can be an effective topical therapy for those who suffer from patchy alopecia. Get some fresh onion, blend it and extract the juice. Apply it on the hair. Alternatively, you may chose to wash it off after allowing it for at least 30 minutes. This method is ideal for people who have time and who can store the juice in the fridge for use within the day. Pour some oil into a frying pan and put on a stove with medium heat. Mince fresh onion and pour it into the oil. Allow it to boil slowly and put off the fire when the onion is about to get brown. After it gets cool, strain the oil, put it in your applicator bottle and use within a week. chop some onions, pour in a small pot of water and bring it to boil. After it boils for about 10 minutes, put off the flame and allow it to get cold. You can use it to rinse your hair, at least once a week.